Here's some great advice for you.....Count Your Blessings! Need a quick card? I think I made this card in about 10 minutes. All of the supplies are from My Favorite Things. 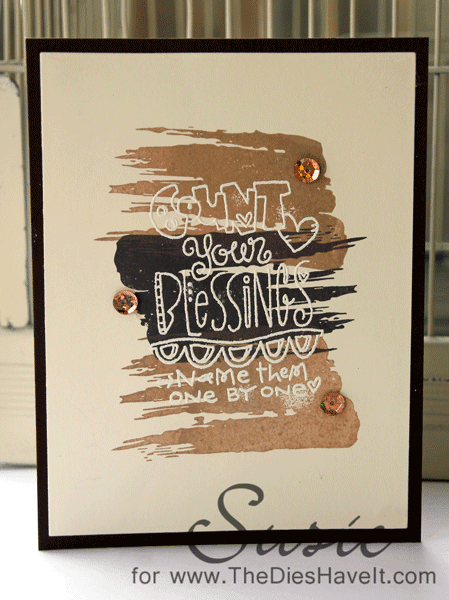 I stamped 2 shades of brown onto a tan piece of card stock using just one stamp. I turned the stamp in different directions to get a different look each time. Then I stamped my sentiment using Versamark ink. I heat embossed the image using some white embossing powder. I matted my card stock on some dark brown card stock and then added three sequins. Easy Peasy! Have a great day....and count your blessings!